Born in Lincoln in 1934, T M Rudkin (Terry) was drawing at the age of four and according to his family and friends what he produced was “extra special”. Although he had drawn and painted ever since childhood it did take a long time before he could become a full time artist. His mother died when Terry was thirteen and his father who was in the RAF had to bring up three young boys. Terry followed his father by joining the RAF as a regular serviceman and was posted to RAF Coltishall in Norfolk. In the late 1950’s having left the RAF he enrolled at the Norwich School of Art and studied life drawing with the acclaimed late artist Leslie Davenport. 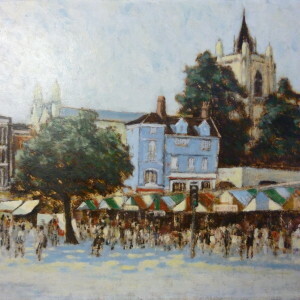 From the early 1960’s Terry had a series of successful exhibitions in Norwich and his paintings were selected to hang in exhibitions at the Mall Galleries in London. For a long time Terry worked outside the art world but always managed to paint when time permitted, he worked at Sexton’s shoes, followed by running his own shoe shop with his wife and later a newsagents in Magdalen Street, Norwich. Terry’s artistic calling was always beckoning and in 1985 at the age of 50 he eventually became a full time artist. 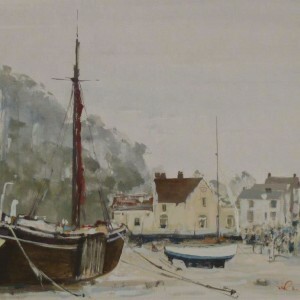 His paintings soon attracted collectors and important commissions came from local businesses, one such patron required Terry to supply two hundred paintings depicting local scenes for two prestigious newly built Hotels in Norwich. Terry had a fascination for the works by van Gogh following numerous trips to Provence, culminating in a special centenary tribute “Thank you Vincent” exhibition in1990 at Tudor Galleries. Terry was fortunate to live in the centre of Norwich in a house which dated back to 1666 from where he could walk out and find an abundance of subject matter which provided inspiration to paint the historic city all around him. T M Rudkin died in 1996.